A new report drills down into the areas of biggest vulnerabilities in small businesses' networks. If there were any doubts as to the magnitude to which cyberattacks impact IT service providers, the rash of high-profile attacks in the first half of 2017 should have definitively erased them. From Russian hacks to WannaCry to NotPetya, the slew of ransomware and other cyberattacks leading to data breaches has brought cybersecurity to the forefront of everyone’s minds, whether or not they work in IT. Ben Yarbrough, CEO of Calyptix, says he wanted the study to drill down to network security data from the smallest networks – those ranging from about 5 to 100 endpoints. Intrusion detection alerts were collected from security appliances at these networks for a single 24-hour period in August 2017 for the report. The report confirms that small businesses are frequent targets of cyberattacks and offers specific insights as to where channel partners need to be focusing their energies when devising a comprehensive security solution for their SMB clients. 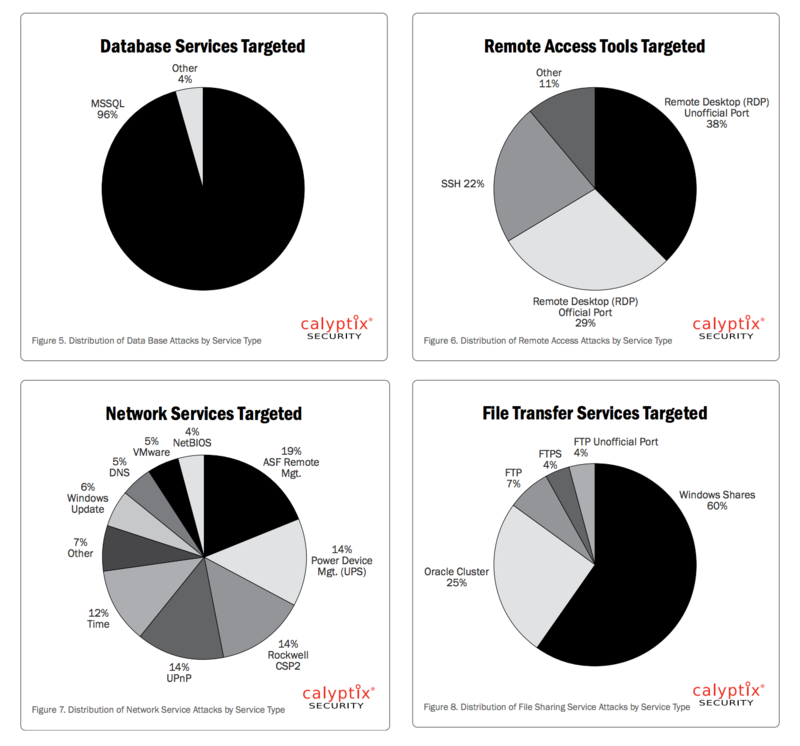 For example, the study outlines in detail exactly which services attackers use the most to gain entry into businesses’ systems, preferred targets by geographic region and the industries most favored by hackers. The threat is real and small businesses cannot hide in obscurity on the internet. Small business networks are under constant threat and reconnaissance by focused attackers with interest in very specific systems. Top targets at small businesses include Microsoft SQL database, remote access by Microsoft RDP or SSH, VoIP telephone systems, any enabled web content or access, remote management tools, UPS power systems, Windows update systems, Windows file shares and FTP. Attackers would not purse any of these systems unless occasionally successful. This reality suggests there remains significant fertile ground for MSPs to educate and serve small business owners. MSPs should utilize every available tool to minimize exposure of their own systems as well as their clients from unauthorized access, including VPNs, restricting management access, account lockouts, and enhanced authentication measures. Given the scale of attacks and reconnaissance, MSPs should always operate IDS/IPS systems in a protective mode (e.g. block traffic). MSP’s should not establish any publicly facing system (e.g. internet exposed) without deliberate consideration and planning, including network segmentation, vigilant patching and maintenance as well as monitoring, especially for unauthorized or unusual access. MSPs should exercise caution with cloud service providers to ensure cloud based systems implement reasonable access controls, timely maintenance and ongoing monitored. As is almost always the case, the client is the biggest source of vulnerabilities (and cybersecurity headaches), and partners need to make sure to build governance guidelines into their service agreements in order to save both their clients from attack and themselves from liability.